Now that the weather is getting warmer and there are more daylight hours, many runners are coming out of hibernation. If you took a few months off from during the winter and are getting ready to pick up the miles, there are a few things you should keep in mind before you head out the door. It is easy to want to pick up training where you left off last fall, but you must be very careful about ramping up the miles too quickly. Doing too much too fast greatly increases your chances of an injury. How bummed would you be if you were sidelined even longer, missing out on the great running weather? The general rule about increasing mileage is that you should increase by no more than 10-percent each week. For example, if you run 10 miles during your first week back, run no more than 11 miles the following week. If you are injury-prone or are currently recovering from an injury, you should stick to a 5-percent increase week-over-week. This may be tedious and hard to do, but it will help ensure that you stay injury-free. After taking a few months off from running, it is easy to forget how old or worn your running gear is, particular shoes. When was the last time you replaced your running shoes? If the answer is "I don't know," you are probably ready for new ones. You should replace your running shoes every 300 to 500 miles, depending on your size, weight, gait, and shoe type. Keeping a running log is great, not only for tracking your progress and runs, but also for keeping track of shoe mileage. In your running log, make a note of the date you started wearing a new pair of shoes, then keep track of your weekly running mileage. You'll then be able to easily calculate when you've run 300 to 500 miles in those shoes. Whether you've been running for years or are brand new to running, setting goals can be very beneficial. Working toward a goal allows you to feel like you are accomplishing something and gives you a purpose for getting in those miles. Whatever your goal is, it should be challenging, yet achievable. If you are brand new to running, maybe your goal is to finish a 5K, or to be able to run for 20 minutes without stopping. Perhaps you want to get faster, stronger, or lose weight. Whatever your goal, set a realistic timeline to meet it and celebrate in a healthy way when you accomplish it. Treat yourself to some new running music, give yourself a pedicure, or buy yourself a new pair of running shorts. In many parts of the country, spring weather is very unpredictable. Be prepared for any kind of weather. Make sure you have gear for cold mornings, such as long pants, gloves, or a wool cap, as well as clothes for warm weather, like shorts and a T-shirt. Also make sure you have a good water-resistant jacket on hand if you live in an area where spring showers are likely. If you have seasonal allergies and the spring weather makes you sneezy and itchy, consider joining a local gym or investing in a treadmill until your allergies subside. 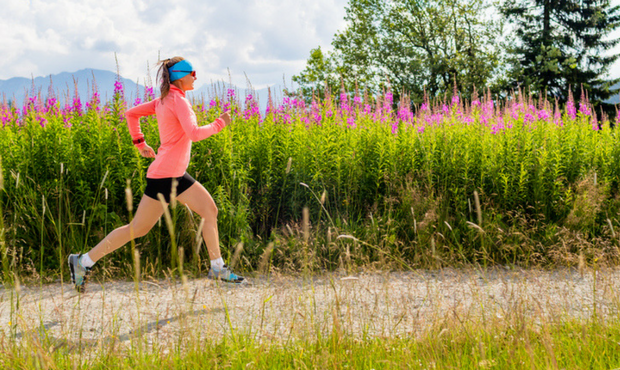 If running outside makes your allergies flare up, you are probably far less likely to go for a run. If you can stay indoors to run, however, you won't miss out on your training and you can keep your allergies under control.